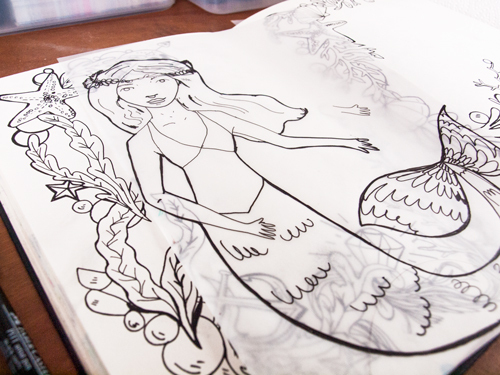 Mermaid Illustration for a Birthday Present! 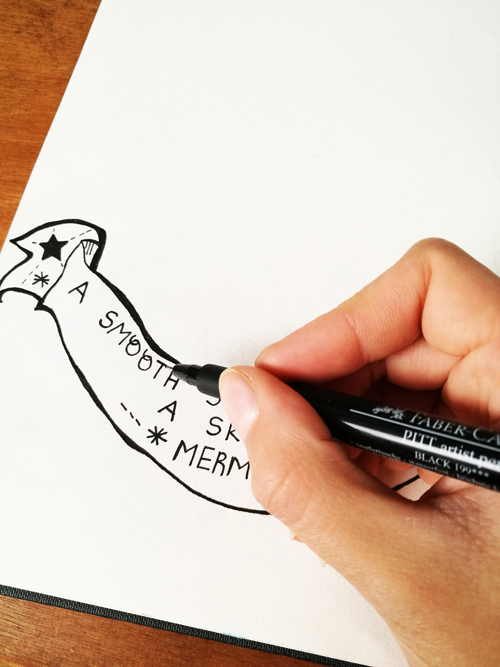 It’s not often I draw mermaids, actually, I’ve never drawn a mermaid before! My cousin Savina got in touch with me as she wanted an art print for her friends birthday. I really enjoyed making the illustration and I would love to do another illustration similar to this in the future! I thought I would share with you the initial design processes until the final image as I don’t think I’ve ever written about it. There are no photos of how chaotic my work desk can get though! I like the chaotic mess though; I was never a super tidy person to begin with as I sort of thrive from it. By the way, I am a very neat and organised person in general and our house is tidy if you ever do come round! 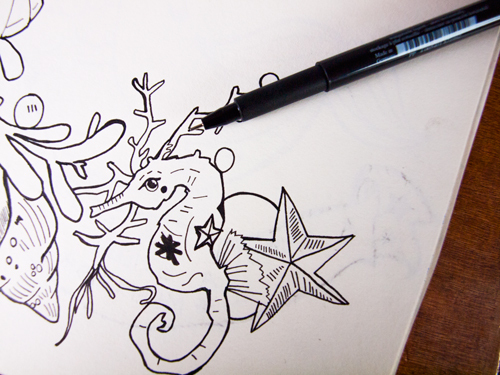 I’ll always start with a rough sketch in my sketchbook so that I can visualise all the parts I need to draw out. I like to draw things in parts- don’t as me why- but I just do! It’s probably so that I can easily redraw a new part without having to sketch the whole thing out again. Savina had already told me what she wanted, which was obviously great, so all I had to do was plan it all out as well as decide what the colour scheme was going to be. I usually work with one sketch and I’ll send it to the client so that they can see where it’s going. It’ll be like a proper squiggly drawing- nothing polished as of yet. The one thing that really helped me was that she sent me some photos of her friend, so from that I wanted to capture her personality through the print itself. I’ll spend quite a lot of time drawing it all out. 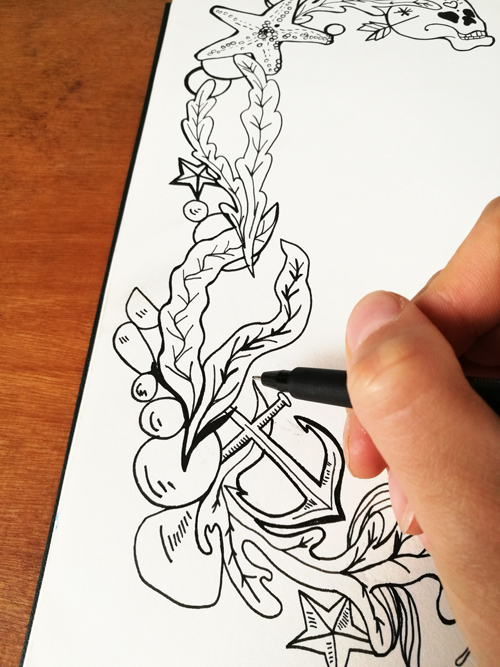 It can take from 20 minutes to over an hour depending on the level of detailing that needs to go into the drawing. If it’s a collage, which I do as well, it could probably take longer. With this illustration I drew out the borders separately so that I can spend more time focusing on each section. The bigger the scale of the drawing is the easier it is- does that make sense? So I rarely use an A5 sketchbook unless I’m going out to do some observational drawings. It’s always A4 and A4 forever it shall be! 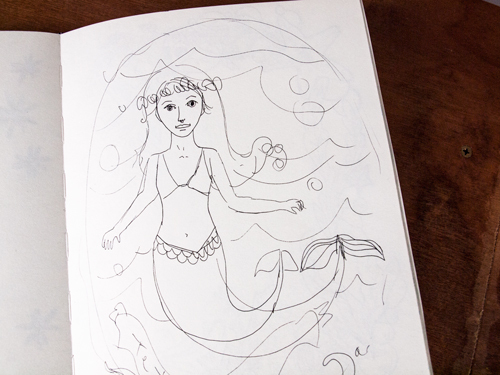 Next, I drew out the mermaid but I wasn’t happy with it as she was slightly out of proportions. Also, Savina asked me to tweak it slightly. 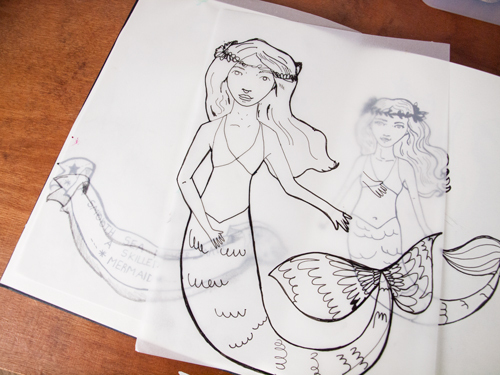 I drew the mermaid out again onto tracing paper. Once I’m satisfied with all the elements I’ll then scan them all into Photoshop and then digitally edited it. I’ll spend time changing the layout and trying out different colour combinations. I knew I wanted different shades of pinks, blues and purples so I decided to go for a watercolour effect for a ‘sea’ effect. Every part of the stages I’d email Savina back to get her feedback. I think it’s especially important to communicate with your client as you’re going and on both sides being clear with the expectations. 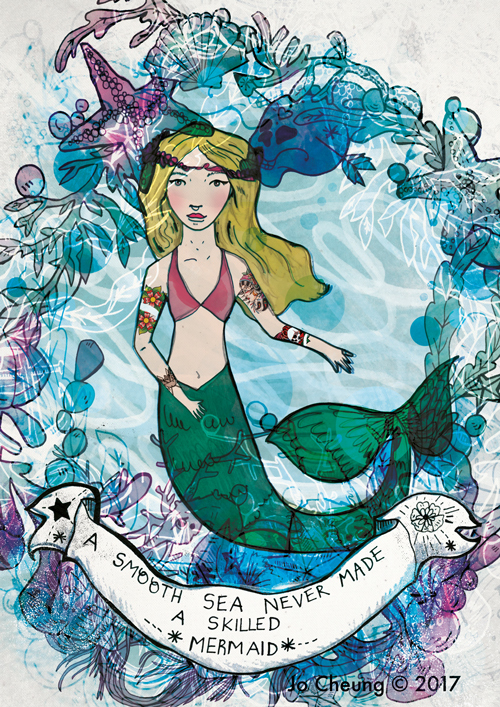 The mermaid initially had blue hair but Savina asked me to change it to blonde instead which I think it looks a lot better as she looked slightly ‘lost’ with the background. 4. The Final Stage- One Finished Art Print! And that’s it! Once Savina was happy it I printed it out for her and sent it off. It took over a couple of days to do, bearing in mind each of the stages weren’t done in one go. I made sure I made a note of the time and dates of how long I’d spent on each of the stages. If you have any questions about anything do get in touch with me. I would love to hear about your creative processes and whether there are any differences or similarities in the way that we work. I’m available for private commissions so please feel free to email me at [email protected] specifying the occasion, who is it for and any other requirements. Thanks for reading and take care!